I gave my first shot at oatmeal cooked in the crockpot, and I was thrilled to discover that they really are incredibly delicious. The texture reminded me exactly of the kind of oatmeal you’d get served at a restaurant; creamy, fluffy, and just…simple. When I was looking through various recipes, I couldn’t decide if I wanted to go the route of something flavor-specific (i.e., apple cinnamon, banana nut, etc.) but ultimately, or just plain. But in the end, I decided to add just a touch of sweetness so that I could change up the toppings when I wanted to. The oatmeal is crazy easy to make, just as most crockpot recipes are…throw the ingredients in, give it a stir, turn it on low, and let it do it’s thing. I ended up letting mine cook for close to 9-10 hours, but that’s because I wanted it to thicken up just a bit more. I’d say it was probably ready by about 7-8, depending on how thick/thin you prefer it. No matter what though, a crockpot full of oatmeal is never really all that appealing now, is it? Thankfully, the end result is a beautiful thing. This batch made me about (4) 1-ish cup servings, but you could easily double the recipe to make more if you needed to. Cook once and have breakfast ready for the week ahead! This crockpot oatmeal is rich and creamy, thanks to steel cut oats, and are totally customizable, too. Coat the inside of the crockpot with a good layer of non-stick cooking spray (*don’t omit this step! Mine still stuck a bit with having sprayed a good amount). Add the water, oats, almond milk, brown sugar, salt and vanilla extract/ . Stir to combine. Cover and cook on low, about 7 to 9 hours, until the oats are cooked through and creamy. Serve and enjoy or portion out for the week and enjoy later! *I've had the best results with consistency if I make this during the day where I'll be able to stir every once in a while. Because the oats do tend to stick a bit to the sides, being able to monitor and stir will help significantly with this. I topped my first bowl, as you can see, with some banana slices, raisins, and a big scoop of peanut butter. Tomorrow, I’m thinking I’m going with chopped apples, raisins, almond butter, and some cinnamon. What about you? 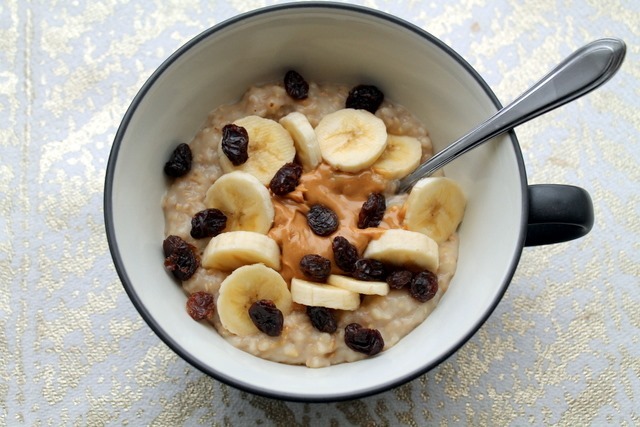 What are your favorite oatmeal topping combinations? I'd totally agree with that! 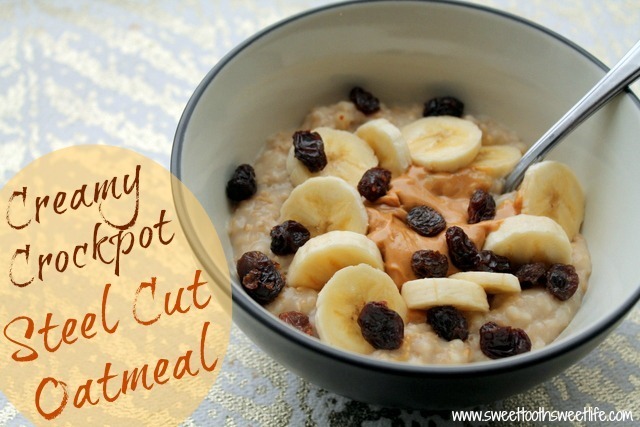 I've never made oatmeal in a crockpot before but I would love to wake up to a hot breakfast! I've seen crockpot oat recipes floating around the web, but never knew if it was a reliable recipe that actually worked. Good to know that oats in the crockpot really are as good as they sound! Your bowl look so delicious! This looks delicious. I was wondering if you've tried Silk's cashew milk. I find the taste subtle and it's pretty creamy. I haven't actually! But it's funny you say that because the commercial was on the other day, and my husband was like, geeez, do they make milk out of every nut now?!? LOL. I'm intrigued though, glad to hear you like it! Corck pot oats make the morning so happy and easy. Thanks for sharing this great idea. oatmeal has been my go-to lately with this cold weather. I top mine with flax, fruit and almond milk. I love this! I have never made it in a crockpot but it looks so easy. I like mine on the thicker side, too. What a perfect meal to have ready for the morning! I make oatmeal often but have never tried it in the crockpot. My favorite toppings are chocolate protein oats with strawberries and cacao nibs or vanilla protein oats with banana almond butter and cinnamon. Goodness in a bowl! I've never made oatmeal in the crockpot but looks like I might have to try! My favorite toppings are cinnamon, banana, and blueberries. Also, if I need a breakfast that will keep me more full, I add in a scoop of protein powder! I made the energy bites that you posted yesterday and oh - my - word! SO good. Like, taste like candy good! Yes, they're awesome aren't they?! Did you make them with the walnuts or with almonds?? I made them with walnuts! I used to make pumpkin steel cut oatmeal in the crockpot on Sunday and have it for breakfast all week long. I got out of it when spring hit, and have yet to crave it (I've been loving english muffins with PB, banana and raisins lately). However, I would like to make a batch of "plain" oats ... that way I could mix up the toppings. Well ... let's be honest - I know my toppings would consist of PB and banana anyway. It's such a classic breakfast combo! Thanks for sharing your recipe - I'll have to try it out soon! I *almost* made these as pumpkin but decided to leave it out for now. Loooove me some pumpkin oats, though! I'm traveling right now and this makes me want to go home and make oats so badly! It would also be lovely to be on the correct time zone, but we'll, can't have everything. I love crock pot oats because they're so easy! My favorite toppings are fresh blueberries and walnuts! Looks divine! I've been really into overnight oats lately. My go-to toppings are honey + walnuts + banana. I've never made oatmeal in a crockpot before, but it looks perfectly cooked and creamy, so I might have to give it a try! Thanks for the idea. I like oatmeal topped with pretty much any fruit, but I think my favorite combination is peanut butter and banana (classic :) ). I think my crockpot runs hot, because I can put it on before I go to bed, usually at 10, get up at 5:30, and it's scorched. And that's on LOW. But I love steel cut oats way more than regular oats. Angela at www.OhSheGlows.com has a great recipe for make ahead steel cut oats that you make on the stove top, and refrigerate until ready to eat. Hey Courtney! I thought I would comment with what I do. Ingredients: 1/2 cup steel cut oats 2 cups water 1 cup low-fat milk pinch of salt 1 banana dash of cinnamon Directions: Place the oats, water, milk, and salt into a heat proof bowl. I used a ceramic bowl and it worked great. Stir so that everything is combined. Place the bowl into your crock pot. Fill the crock pot up with water so it reaches half way up the bowl that you inserted. Place the crock pot lid and turn on low. This cooks for 8-10 hours so it is perfect for overnight cooking so you have hot oatmeal waiting for you when you get up. This lasts at least 3 days in the fridge and is yummy as a leftover. Mash the banana in a bowl, add 3/4 cup of oatmeal and the cinnamon. Stir together to combine and enjoy! I don't have any issue with the oatmeal sticking because of the water in the crock pot steaming it. I hope this helps you guys too! That is genius! I would have never thought to put the oats in a separate bowl inside. I may need to try this approach - thanks, Becky! Becky, I decided to give this recipe a try but only had a 1/2 cup of cashew milk left, so I used 2.5 cups water. I also only had old fashioned oats, so I am hoping the total amount of liquid isn't too much for the amount of oats since they are not steel cut. Thoughts? I think old fashioned would cook faster possibly resulting in a mushy oatmeal. I'm not quite sure though. The cashew milk sounds delicious! How sweet of you to reply, Becky! It was a little too much water for the rolled oats, but I managed to thicken it up with lots of peanut butter! In the future, I will reduce water by a cup overall and I think that will do the trick! Oh, this is good to know! Thanks for sharing, Alaina! That's awesome! I'm super glad it worked out! Hi Courtney, Have you ever used the crockpot liners?? If not, pick some up ASAP! They are life changing... it's basically a big plastic liner that you put in before all of the ingredients so once you're done you simply pull out the bag and toss it! No more scrubbing the stone! (In my grocery store they are near the foil and plastic wrap, typically next to the roasting bags). I will never cook without them again, they're especially handy for queso!! I've never been a huge oatmeal fan, but I think it's because I always try to eat it plain which is just boring! After reading all the topping ideas, maybe I'll try it out. Plus, crockpot meals are SO EASY. I've seen this recipe a few times around always using steel-cut oats. Is that required or can you use old fashioned oats as well? Oh my gosh, you've definitely gotta try it!! It is so funny... I go in cycles of loving oatmeal, and I just started again last week, and suddenly I've seen so many people posting about oatmeal. I only eat the instant kind because...lazy... but I eat the Oat Revolution Steel Cut Maple and Brown Sugar with a spoonful of peanut butter and 5 blackberries (the perfect amount...). I'm with you - I also go through phases with oatmeal! I feel like I used to eat it all. the. time. but got out of it for a while. Now, I'm all about it again! 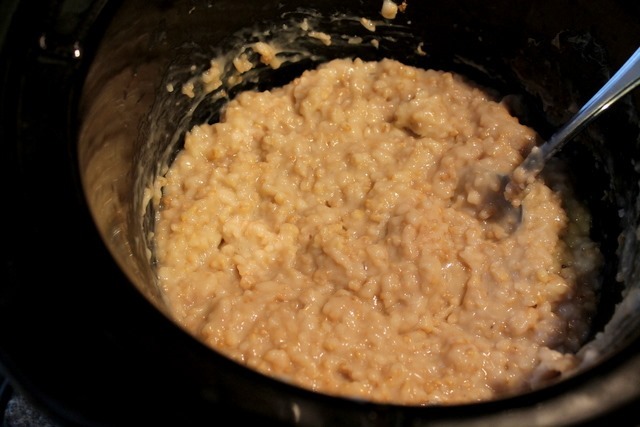 steel cut oats are my favorite but i don't have a crock pot so i make them on the stove, mmmm. I love adding golden raisins and apples to my oatmeal. My FAVORITE mix-in right now, though, is Sunbutter. It is SO good! I love putting dried fruit in my oatmeal! Cranberries, raisins, and dates are my favorite. Almond butter or nut butter and fruit. Berries are my fave! Love oatmeal though - thanks for this fun variation! I need to get steel cut! I still have never tried making steel cut oatmeal! I stopped buying/making steel cut oats because I could never get them thick or creamy. Now, I need to go buy them again!!! These sound so good, I definitely need to try them! I love a good crockpot recipe :) My favorite way to eat oats is with Trader Joe's Very Cherry Berry Blend frozen berries defrosted on top with some almond butter. Yum! 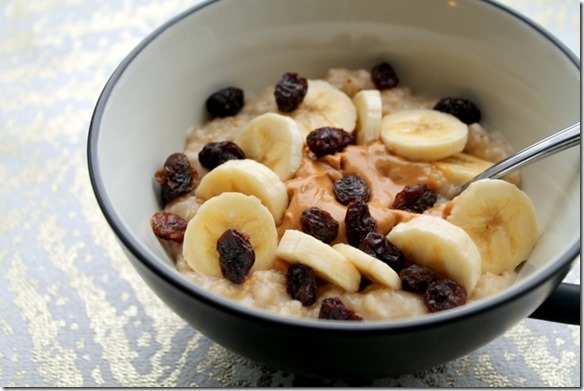 I make oatmeal several days a week for breakfast but I've never done it in the crockpot! As for toppings - banana, PB and jam are my go-to. Do you just reheat this everyday? Do you add any liquid to it when you do? I'm excited to try this! What size crockpot do you use? Or does it matter? Hi Courtney! This recipe was linked from your Friday Facts post today and it looks delicious! I have a quick question though - do you just cook this on Sunday then divvy it up into different containers and stick them in the fridge for the week? Then just microwave at work? I am trying to picture what the texture would be like after sitting in the fridge for a few days. Thank you! I followed the recipe and it turned out disgusting! Did you mean to add the milk afterwards? Good idea but maybe not so accurate measurements?! Don't mean to be too harsh, just giving feedback. I'll have to try again but modify the liquid. I'm a big fan of the blog, this recipe just did not do it for me. All the best! I'm so sorry it didn't turn out for you! No, you definitely add the milk at the beginning with everything else. And I've made it numerous times with the same measurements and it always turns out great. I'm not sure I'd modify the liquid much more than what is listed - maybe cook a little longer/shorter? Sorry again!